Ghillies Lodge is situated in the heart of the Scottish Highlands, just outside the scenic village of Crianlarich. Ghillies Lodge enjoys a stunning setting, overlooking the rest of the estate and the glen, with fantastic views over the loch. Inside, the lodge is furnished to a high standard and sleeps up to 6 comfortably in two kingsize double bedrooms and one twin bedroom. A futher two people can be accommodated using a full king-size hidden drop down double bed in the living area. Portnellan is a very popular holiday destination in an extremely beautiful area of Scotland, with many holidaymakers returning year after year. With such stunning scenery, beautiful mountain ranges, breathtaking lochs, excellent fishing and a huge abundance of wildlife it's not hard to see why! On the first floor there's a master king-sized sleigh style bed in the master bedroom, with TV,DVD and Sky Freeview channels. There is a private balcony and ensuite bathroom with power shower over the bath. There is a seating area with his and hers wadrobe. The second twin bedroom also has a TV with Sky Freeview plus an ensuite bathroom with power shower over the bath. There is a seating area with his and hers wadrobe. On the ground floor there is a king-size double bedroom with Freeview SKY TV & ensuite shower room with full size corner spa bath and private sauna. There is a full kingsize hidden drop down double bed in the lounge - to be used by 7th/8th person. Bed linen, towels, bathrobes and slippers are provided. One pet is permitted at a cost of £30 per stay/per week. Midweek breaks 4 nights: Mon - Fri.
Set centrally in the Scottish Highlands, the family owned Portnellan Highland estate is a stunning location and great base and location to head off exploring the delights of Scotland with easy access to Loch Lomond, Glencoe, Scottish West Coast, Oban and the Gateway to the Isles, Fort William, Loch Ness and so much more. 'Tempur' comfort topper mattress should you require a softer feel bed - £20 per booking. A selection of mountain bikes are available to hire. Your accommodation is only provisional until written confirmation is received. The price of your holiday will be confirmed to you by email or post. Special rates are available for returning guests – please ask for details. All prices include VAT. We provide Egyptian Cotton bed-linen and towels, toiletries, cots and high chairs (please provide own linen for the cot); TV with SKY package; DVD library; selection of board games, local maps and information. 5 miles wild salmon and trout fishing on the estate lochs and river (within season), boats, Canadian canoes and kayaks. A selection of mountain bikes are available to hire at £20 per day per bike. £15 half day. Helmets are available however, it is recommended to bring your own helmet if you have one. Clay Pigeon and Target Shooting - Clay pigeon is available upon advance notice. Please contact Cameron for further details. We provide bathrobes, slippers, face cloths and luxury Arran Aromatic toiletries. 37″ LCD TV with SKY TV package (Variety with Sports), Blu Ray DVD and Nintendo Wii. Free Weber gas BBQ with gas canister is provided in all 5 star properties. No transaction fee for all cheque, cash, Paypal and BACS settlement. All debit and credit cards including AMEX are free of a transaction fee up to £250.00. Over £250.00 incur a 2.5% transaction fee. Euros are accepted into a business Euro account. Please contact Portnellan for a price in Euros. Please contact Cameron for further details if required. Is included in the price of your holiday between 20th July and 5th September. All other times the first £20.00 of electricity consumption is gifted. If there is any further consumption the balance is settled upon departure andis metered and charged at 25p per unit. All 2 night stays are inclusive of electricity consumption. A Weber gas BBQ can be provided. It will be brought to you upon request. There is a £25 usage fee including gas. The use of a Weber gas BBQ is free for 5 star properties. SKY TV freeview is included in all properties. SKY TV package Variety with Sports is provided in 5 star properties free of charge. Wifi service is available throughout the estate. All properties have complimentary WiFi. Properties accommodate the number of persons shown on the tariff. Occupation must not exceed the chalet or cottage maximum. One pet is permitted in certain 4 star properties by prior arrangement only at a charge of £30 per stay/per week. We are dog-lovers at Portnellan, but in the interests of safety and enjoyment your pet must be kept under control at all times. Please be aware the surrounding lands are working farms with sheep and cattle. A cage or crate is preferred for your pet to rest in, but at the very least you must bring suitable bedding. Pets cannot be allowed on chairs or beds and must be kept clean and dry when in the proeprty. Please collect and dispose of all dog waste considerately. Arrival is any time after 3pm (April-October) The properties will be ready at different intervals throughout the day of your arrival. We will make every effort for an earlier check in time. Especially within Winter months (November-April). Please contact to discuss a relaxed arrival and departure. If you plan to arrive late in the evening, please let us know in advance so we can ensure you’re well taken care of. Departure is up to 10am so we have time to prepare for our next guests. Later departures at certain times of the year and for short stays may be arranged by prior arrangement. Please call to discuss. Groceries, butcher meat, fish and other provisions can be provided on your arrival day. Contact details for local businesses that provide these services can be provided upon request. Please contact the business directly who will forward an order form to be completed. You can either settle directly or with Portnellan at the end of your holiday. When you arrive you will see that the property is cleaned and maintained to a very high standard. You are expected to maintain these high standards of cleanliness in the lodge throughout your holiday. Upon departure the property must be left in the same condition as it was found. We have a team of housekeepers but they are not slaves – so please respect the property as your own and do not present us with the embarrassing situation of having to ask for a cleaning surcharge of up to £100. Glasses do get broken, but they do have to be replaced, so please note you will be asked to settle for any broken glasses. They are £4 each. A security/key deposit of £100 is required on arrival. This amount is held on a credit card. Any damage, breakage or spillage in your property should be reported so we can maintain the high standards our guests expect. Repairsor damage will incur an additional charge, which must be settled in full. Full weeks: A deposit of 50% is required on booking and the balance must be paid no later than 8 weeks (56 days) before your arrival. Cancelled holidays are subject to the charges detailed below. Cancellation Indemnity insurance is available on request at a small additional cost. Short stays (less than full weeks) must be paid in full on booking and are non refundable. If you’re not able to enjoy the holiday you’ve booked, we recommend you tell us as soon as you can. Cancellation charges are based on the likelihood of re-selling your holiday. 8 weeks before, deposit retained. 8-6 weeks before 50% holiday cost. 6-4 weeks before 60% holiday cost. 4-2 weeks before 80% holiday cost. 2 weeks before full holiday cost. Situtated in beautiful surroundings with loch views. Set on large private family owned estate. Patio doors open out onto a large veranda with outdoor furniture & BBQ (upon request). Large open plan living/dining area with hand built Bavarian breakfast area. Royal Doulton crockery, wide range of glasses, cooking utensils, pots and pans, tea towels and even an oven gloves. Kitchens are fully stocked with all of the equipment & utensils. Comfortable large leather sofas, arm chair and a coffee table. 37" LCD DIGITAL TV, SKY HD with Blu Ray DVD & Nintendo Wii. Barvarian dining table with bench seating. King-size double bedroom furnished with Freeview SKY TV & en-suite shower room with full size corner spa bath and private sauna. Full king-size hidden drop down double bed in the lounge - to be used by 7th/8th person. Master double bedroom (king-size) with 'sleigh' style bed, TV, DVD with freeview SKY, private balcony and en-suite bathroom with power shower over bath. Twin bedroom with TV with freeview SKY & en-suite bathroom with power shower over bath. All bed linen, towels, bathrobes, face cloths and slippers provided. Beds are made up for your arrival. Arran Aromatic handwash and bath/shower gel in bathrooms. WIFI available throughout at no charge. 5 miles of wild salmon and trout estate loch and river fishing. 5 miles of loch and river game fishing. The variety of fish at Loch Dochart include: salmon, brown trout, arctic charr, eels, pike and perch. Portnellan guests benefit from free boat and rod use. The salmon fishing season runs from the 15th March - 15th October. The trout fishing season runs from the 16th March - 15th October. Crianlarich Village - Only 5 minutes by car, there is a local pub, a tea room, a village store and a couple of hotels in the village. Falls of Dochart - Situated just outside of Killin on the western end of Loch Tay. Ben Lawers - The highest mountain in the southern part of the Scottish Highlands. Glencoe - Short & spectacular drive away. Cycle routes at Portnellan - There are miles of cycle routes to enjoy, both on and off road. There are trails around the Loch, Glen Lyon and Drummond Hill with various levels of difficulty. Water Sports - Within easy reach of Portnellan activities include: canoeing & kayaking, boating, swimming, paddleboarding, sailing & windsurfing. The Scottish Crannog Centre - Discover what life was like in Scotland 2,500 years ago. Scottish Wool Centre - Great visitor attraction, with a daily dog and duck show, a menagerie of animals and a food and whisky hall. Nae Limits outdoor activites - Adventure activities including white water rafting, canyoning and quad biking. Auchingarrich Wildlife Centre - A great variety of wild animals, children's play areas and pony rides. Golf - There is an 18 hole golf course on-site, as well as an 18 hole putting green. McQueen Gin Distillery - Located in Callander, Stirlingshire, tours of the distillery can be booked. Loch Tay Safari - Travel on an RIB (rigid inflatable boat) across the loch and enjoy the stunning, dramatic scenery and get up close to wildlife in hidden areas of the Loch. Castles - Ruins of Loch Dochart Castle, just a short distance from Crianlarich. Eilean Dochart - Visit the ruins of Eilean Dochart castle situated on a tiny island in Loch Dochart. Edinburgh & Glasgow - Approx 1.5 hours drive from Portnellan. Towns & Villages - The towns of Oban, Fort William, Perth, Pitlochry and Stirling are within a 1 hour drive. Ghillies Lodge is a spascious three bedroom highland lodge with great views over the glens and lochs and mountains beyond. "Ghillies Lodge enjoys a truly idyllic setting overlooking Loch Dochart." Call our specialist booking team on the number below to speak to one of our advisors who will help you find your perfect UK holiday. We specialise in holiday cottages, lodges, log cabins & holiday parks by the water throughout the UK. 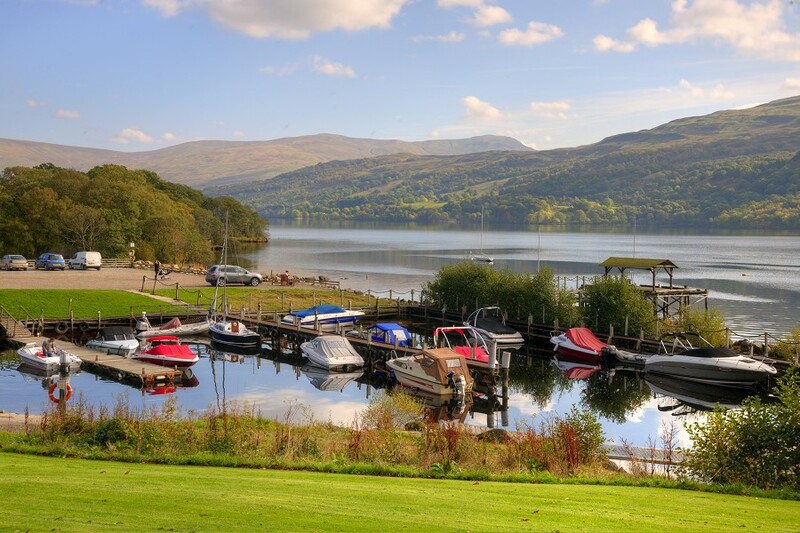 We offer over 2,000 holiday lodges & cottages across the UK in beautiful, remote and popular locations. We are more than happy to provide friendly impartial advice on choosing your perfect holiday.